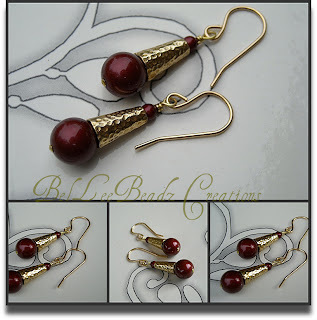 Gorgeous warm, red wine tone, swarovski pearls, bordeaux. Topped by a 'hammered' non-tarnish brass bead cap and dangling off 14k goldfilled earwires, I've kept this as minimilastic as possible. Dropping at 3.5 cm, this is not too 'over the top' for the office. Would definitely kick in some color to a neutral, earth tone ensemble but still luxe enough for cocktails and a dinner date.